I am sure most of you have heard by now that Coach Donte, our PE coach, has been out with a knee injury that he sustained in mid-December while playing basketball. He had surgery recently and is now working on recuperating. It will of course, take time. I am sure you join us in sending him our best wishes for a speedy recovery. Teachers have been doing their best to continue providing PE and conditioning classes as often as they have been able. Meanwhile, the YMCA is working hard to find a sub for Donte while he works on getting well. Coach Juana will start subbing Mondays through Wednesdays, beginning this week, and we are still waiting for a substitute on Thursdays and Fridays. I know this is frustrating for everyone, especially Donte! Thank you for your patience and understanding while we adjust to this unexpected situation. Emerson is participating in the Great Kindness Challenge the week of June 22-26. Students will receive a checklist with ideas of how to be extra kind or be kind in a new way. Check them off as you go. There is no limit to how many acts of kindness you can do, we encourage you to come up with new ideas and share them on the poster in the hallway by the Library. The week will end with a celebration! On Friday, 1/26, Students should wear Emerson t-shirts, sweatshirts, or anything in Emerson colors, blue and yellow! There will also be an all school dance party to celebrate the students filling up the "caught being good" bucket with over 200 CBGs! Don’t forget… documentation and applications are due to BUSD admissions on or before Friday, February 2nd! The 2018 Emerson Auction Is Coming! Mark your calendars: the 2018 Emerson Auction is just two months away. This year we’ll have an Online Auction followed by a Silent Auction & Party. The Online Auction will include great deals on summer camps, dining, local services and more. It will run from March 7th through March 21st. Great news: thanks to you, Emerson families, we've reached the PTA's $60,000 goal for the Fall 2017 Heart of Emerson campaign. To celebrate, we've hung 300+ CDs decorated by Emerson students (including yours) on the fence by the monkey bars...come take a look! Although the campaign is over, we still need to raise around $35,000 this school year to support the great work taking place at Emerson every day. Please show your support by participating in the 2018 Emerson Auction March 23rd and the Read-a-thon in April. If you haven't donated yet, please consider making a gift of any amount by dropping off cash or a check (made out to "Emerson PTA") in the secure Heart of Emerson box outside the office. Every donation helps, no matter the size! 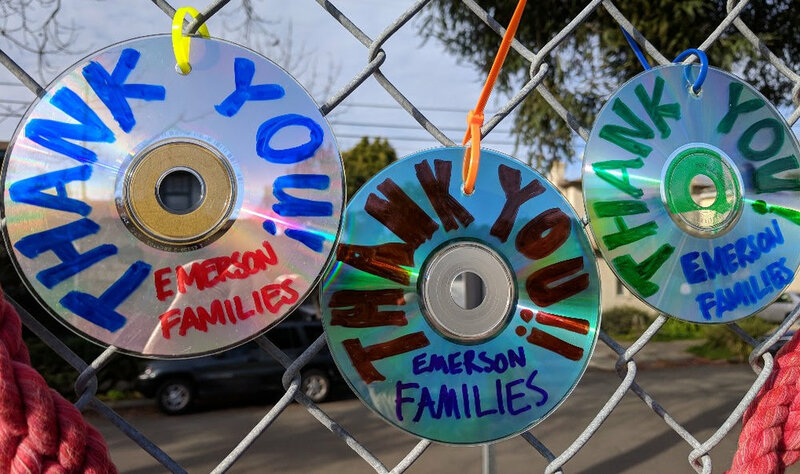 A big "thank you" to all Emerson families for everything you do to support our children and our school! Newer PostOrganize an Event for the Emerson Auction!